Update, July 5: It has come to our attention that this program was canceled this year. We apologize for any inconvenience. Since summer break began at the beginning of June, a group of very talented young string instrument players has been practicing for the Summer String Orchestra performance, which takes place on July 9. This special summer program has provided these dedicated youngsters ages 12 years and older with an opportunity to practice and improve their musical skills. Now they’re ready to show you what they’ve learned. All of us at Elmhurst Toyota appreciate this annual musical enrichment program for young people and encourage you to attend the performance. The Summer String Orchestra program consists of a series of classes offered jointly by the Elmhurst Symphony Orchestra and the Elmhurst Park District. 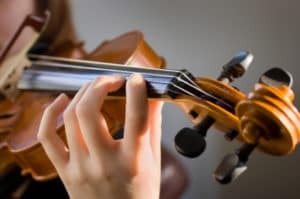 In order to participate in the practice sessions that began on June 4, students must have been age 12 or over, an intermediate-level string player, and a current or former member of an orchestra. Students met weekly to practice at the Wagner Community Center. Through the Summer String Orchestra program, they’ve been challenged by playing a wide variety of music. They’ve also had the opportunity to grow personally, meet new friends and exercise discipline and perseverance by continuing with the program during summer break. The Summer String Orchestra concert on Monday, July 9 is the culmination of the young musicians’ hard work. They’ll perform in Elmhurst College’s beautiful Hammerschmidt Memorial Chapel under the direction of the Elmhurst Symphony Orchestra’s associate conductor. The chapel is the perfect venue for this performance, as it has superb acoustics. So, head over this Monday for a delightful program you won’t want to miss! Monday, July 9, 2018, 7-9 p.m.